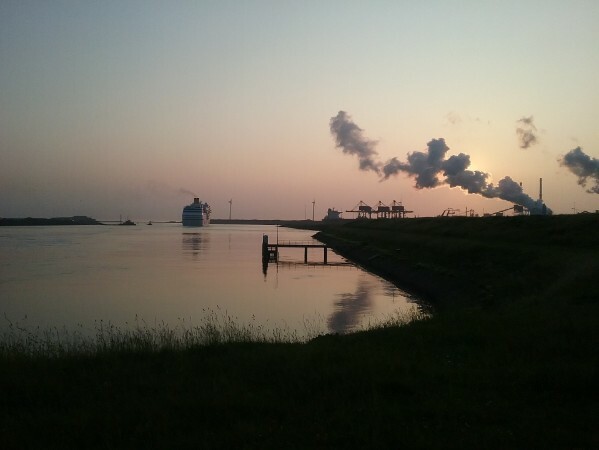 Costa neoRomantica as seen passing Velsen Zuid at the first of june 2012. Her appearance in her new disguise lifts eyebrows. The year 2012 was a very heavy one for Costa Crociere. At friday the 13th of january, one of their flagships Costa Concordia was the first modern giant cruiseship to be lost at sea, claiming the life of 32 people. The ship hit rocks near the small island of Giglio close to Civitavecchia, Italy and capzised close to the little port. It gave the whole cruise industry, Costa in particular, a devestating blow. Next to this, the smaller and older Costa Allegra suffered a major engineroom fire just one and a half months later, something that was widely covered by the press due to the Costa Concordia tragedy. Costa Allegra was taken out of service for repairs, although she wasn't considered worthy to repair and sailed for the breakers at Turkey instead. A beautifull setting shows the ship off to her new destination, Bergen in Norway. The date is the 26th of may 2016. In all this tragedy, Costa had one good moment also, when their totally rebuilt oldie Costa neoRomantica emerged. Although her new lines recieved very sceptical comments, especially from shiplovers, her modernized interiours and European style were widely recognized. 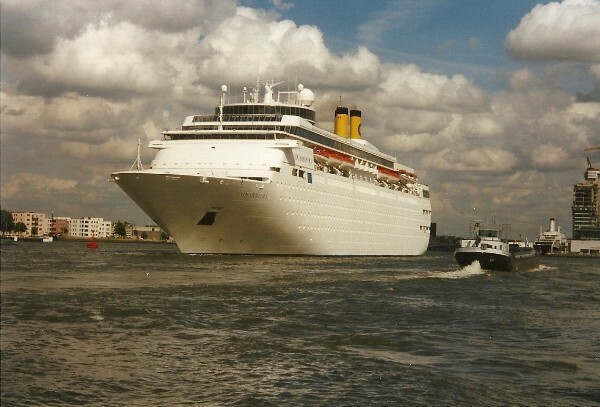 In the beginning of the 1990's, Costa launched a pair of megaships under the banner of the 'Euroluxe-concept'. Over 50.000 tons, the ships would be the largest Italian cruiseliners ever and the would give Costa a more modern place in the fastly growing cruise-industry. The first one was called Costa Classica and started her sailings at the 17th of december 1991. Her younger sister first hit the water at the 28th of november 1992, when she left her building dock at the Fincantieri Navali Italiana (Breda) wharf at Venice. She was build as yardnumber 5899 and was slightly larger version of the two, measuring 53.049 tons, where Costa Classica measured 52.926 tons. The ships had a lenght of 220,52 meters, a width of 32,78 meters and a draft of 7,60 meters. On ten decks, 1766 passengers and 590 crewmembers could sail on their mixed European and Caribbean cruises. 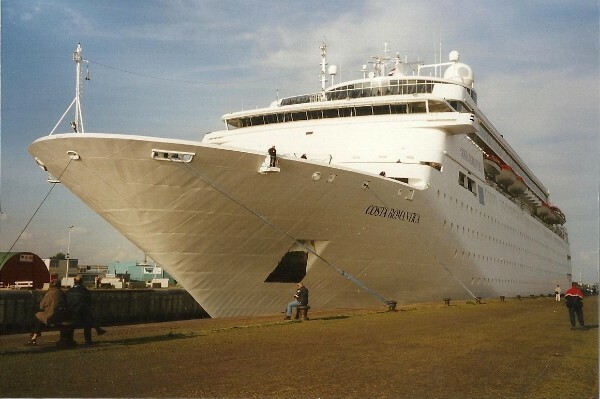 Below, Costa Romantica leaves Amsterdam at the 7th of june 2001. She is shown in het original form, topped by the round lounge above the bridge. The lack of outside cabins in het original design was an important reason for her rebuilding, which altered her appearance drasticly, as you can see above. Costa Romantica was delivered to her owners at the 22nd of september 1993 and her first cruise took her from Genoa to the Canary Islands. She left Genoa at the 7th of october and when she returned from the first cruise, she undertook a repositioningcruise to Miami, from where she started her first Caribbean cruiseseason from november onwards. It is a normal scedule for Costa ships to sail the Caribbean in winter and the Mediterranean in summer. In her first years, the ship was registered in the Italian port of Napoli, but in the year 2000 her homeport became Genoa, as most ships of the company. Her profile was typical of an early megaship, with open bridgewings, an bow-overlooking observationlounge and an open promenadedeck beneath the lifeboats. Also, the ship was given a new Costa trademark, instead of one funnel, she was given three clustered funnels, so in some way, there still are modern three-funnels cruiseliners sailing. Some cabins on the highest deck recieved balconies, but in the beginning of the 1990's, this was no standard. And this was the thing that mostly made her out-of-date just a few years later, when all new ships were designed with hundreds of balcony cabins due to the high passenger demand for those. So at the end of 2011, Costa Romantica was recieving her much debated rebuilding. In 2001, it was still possible to walk the sides of the north lock, this picture was taken in the summer of that year, just before the attacks in America in september took place. For safety reasons, the lock was closed off for the general public. Next to the exteriour, also the interiour was updated. Where the exteriour new feautures still have to 'find their place', the interiours of the ship are great. The ship was rebuild as a very different ship from her fleetmates, especially for people who are searching for more relaxed cruises without the glittery fuzz mostly found aboard ships of the company. For example, during the rebuilding, the theater of the ship was removed, and in place a smaller intimite lounge was added in the also removed, large casino. Children are of course welcome on the ship, but there are just limited facilities for them, so it is better for families to choose another ship. Costa neoRomantica offers a very different environment from most Costa ships, especially for a more quiet clientele. In her interiours, this is highly reflected, as you can see on the next page, where the interiours are shown. A very romatic and so suitable setting for the Costa neoRomantica while she sails past the village of Velsen Noord in june 2012, accompanied by a pink rose. This way, the ship really gives away part of her charm in her new disguise. From the beginning of 2014 onwards, Costa launched a new concept within the fleet for the smaller ships. named the 'neoCollection', this new concept offers a relaxed cruise-expreience for the more sophisticated traveller. It will be a very different type of cruising from the Costa main fleet, but it will not be a seperate company. Like Carnival Cruise Lines themselves, Costa is now also aiming at a more experienced customer. You can clearly say that Costa indeed is the European version of Carnival. Together with Costa neoRomantica, the fleet will be the transferred Costa neoRiviera that is the former Grand Mistral of Iberocruceros. Also the sistership of Costa neoRomantica, the Costa neoClassica will emerge in the first month of 2015 when the Costa Classica is rebuilt to bring the neoCollection up to three units from the beginning of 2015 onwards.